Do you all remember I had posted a picture on Instagram of Ida Naturals haul? Nope, I don't expect you all to remember because it has been such a long time since I bought the goodies from Ida Naturals. Ida Naturals is a Bangalore based organic and chemical free skincare brand by Priya Iyer. If you know me well or have read somewhere you might know that I prefer shopping offline and COD is my favourite mode of payment. I had contacted Ida Naturals way back in April, but at that time they didn't have COD option. I waited around one week and Priya informed me that COD was available. Since I was running out of my lip balm stock after emptying Fuschia lip balm I thought of ordering the lip balm. 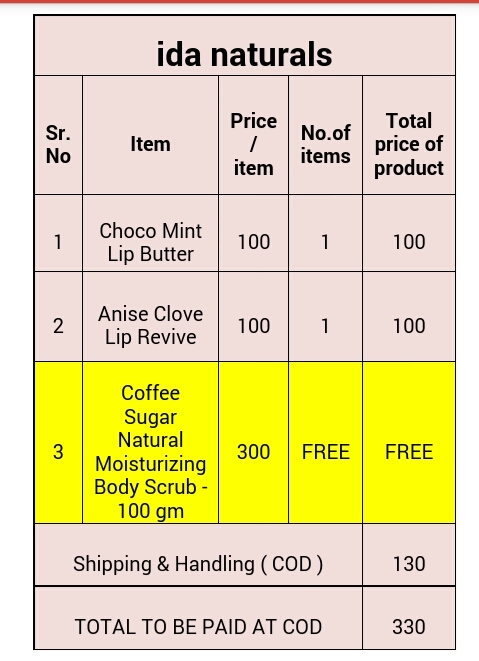 After going through Ida Naturals Facebook page I got to know that Ida Naturals Choco Mint Lip Butter is their top selling item. So into the cart. 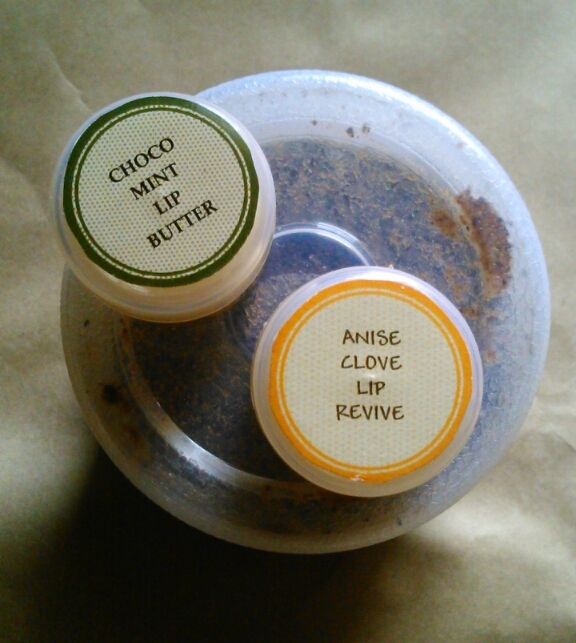 Then the Anise Clove lip Revive caught my attention. So that too into the cart. Since this was the first time I was ordering with them that all what I wanted. But my wishlist included Coffee Sugar Body Scrub and a few body butters. Priya asked me whether this is all I wanted and I told her about my wishlist. She happily sent me Coffee Sugar Body Scrub as a freebie :). Imagine a goodie worth 300 INR free on an order of 330 INR :). My order arrived the same day since I too stay in Bangalore. Due to COD option the shipping and COD charge was added to my order. 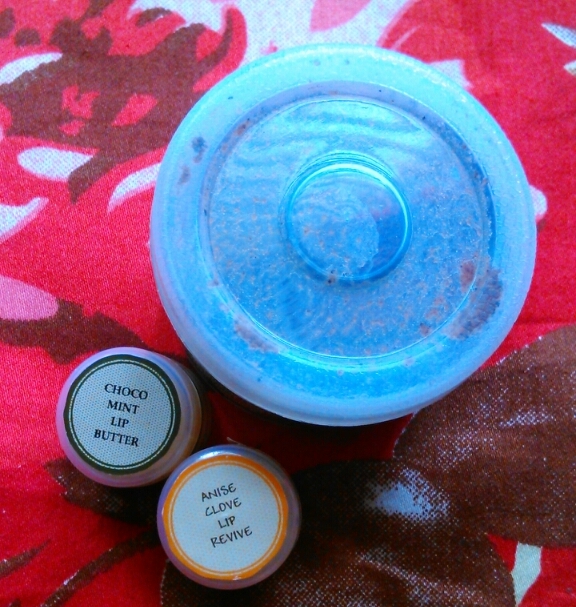 I am totally in love with the goodies I ordered and am going to order more in future. 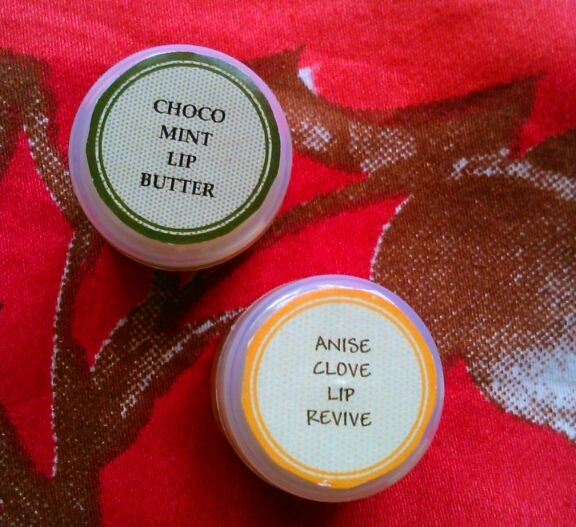 The lip butter is amazing with a cooling sensation and lip revive does an amazing job of actually reviving the lips. Full review of all the products will be posted soon :). You can order Ida Naturals products via Facebook page or email. If you order via Facebook page (like I did) you will receive an order email. So that was all about my tiny toiny haul from Ida Naturals. What about you, do you also make a wishlist before buying something? Share with me below in comments section.